Exploration of the deep ocean (>200 m) is taking on added importance as human development encroaches. Despite increasing oil and natural gas exploration and exploitation, the deep ocean of Trinidad and Tobago is almost entirely unknown. The only scientific team to image the deep seafloor within the Trinidad and Tobago Exclusive Economic Zone was from IFREMER in the 1980s. That exploration led to the discovery of the El Pilar methane seeps and associated chemosynthetic communities on the accretionary prism to the east of Trinidad and Tobago. In 2014, the E/V Nautilus, in collaboration with local scientists, visited two previously sampled as well as two unexplored areas of the El Pilar site between 998 and 1,629 m depth using remotely operated vehicles. Eighty-three megafaunal morphospecies from extensive chemosynthetic communities surrounding active methane seepage were observed at four sites. These communities were dominated by megafaunal invertebrates including mussels (Bathymodiolus childressi), shrimp (Alvinocaris cf. muricola), Lamellibrachia sp. 2 tubeworms, and Pachycara caribbaeum. Adjacent to areas of active seepage was an ecotone of suspension feeders including Haplosclerida sponges, stylasterids and Neovermilia serpulids on authigenic carbonates. Beyond this were large Bathymodiolus shell middens. 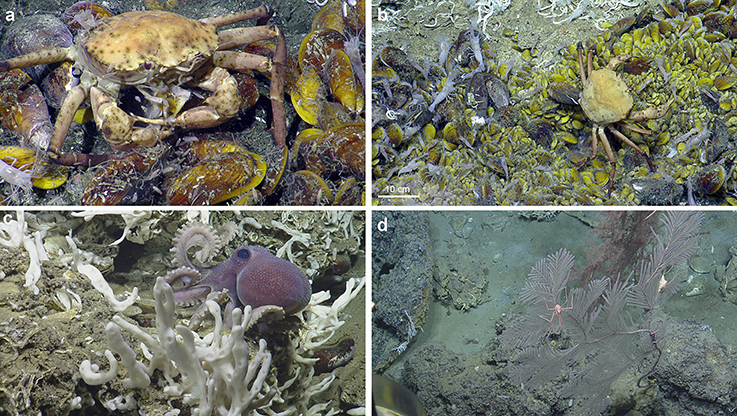 Finally there was either a zone of sparse octocorals and other non-chemosynthetic species likely benefiting from the carbonate substratum and enriched production within the seep habitat, or sedimented inactive areas. This paper highlights these ecologically significant areas and increases the knowledge of the biodiversity of the Trinidad and Tobago deep ocean. Because methane seepage and chemosynthetic communities are related to the presence of extractable oil and gas resources, development of best practices for the conservation of biodiversity in Trinidad and Tobago waters within the context of energy extraction is critical. Potential impacts on benthic communities during oil and gas activities will likely be long lasting and include physical disturbance during drilling among others. Recommendations for the stewardship of these widespread habitats include: (1) seeking international cooperation; (2) holding wider stakeholder discussions; (3) adopting stringent environmental regulations; and (4) increasing deep-sea research to gather crucial baseline data in order to conduct appropriate marine spatial planning with the creation of marine protected areas. Trinidad and Tobago, the most southerly complex of islands in the Caribbean chain, is the largest oil and natural gas producer in the Caribbean region (Ministry of Energy and Energy Industries, 2017). Historically, the energy sector has focused on terrestrial and shallow coastal waters (Rajnauth and Boodoo, 2013), but with the improvements in deepwater technology, increasing global demands for energy, and dwindling reserves elsewhere in Trinidad and Tobago, deepwater (>1,000 m) exploration for oil and natural gas is currently underway in several lease blocks, with exploitation to begin in late 2017 (Figure 1). Potential impacts on seabed communities can result from activities in the oil and gas exploration phase, but are most likely to occur during the production phase. These include but are not limited to the physical disturbance of the seabed during drilling and associated activities, addition of chemical toxicants and sedimentation from drilling muds, and light and noise pollution (Cordes et al., 2016). Impacts on the water column are also likely from the input of sewage water, cooling water, processed cuttings etc. (Cordes et al., 2016). These impacts may persist for many years to decades (Ramirez-Llodra et al., 2011; Cordes et al., 2016). It is difficult to understand and manage the environmental impacts of these activities in the deep sea without knowing what habitats might be affected and the ecology and biogeography of the fauna that inhabit them. Figure 1. Locations of the four methane seep sites surveyed at El Pilar off Trinidad and Tobago during NA054. Gray lines denote Exclusive Economic Zones (EEZs) in the main map. Within the Trinidad and Tobago EEZ, oil and gas lease blocks can be seen. The blocks that have been leased are colored transparent gray. ROV dives tracks can be seen in the inset map: green = Dive H1392, red = Dive H1393, and blue = Dive H1394. Seep sites are indicated by black circles and the site name. Lease blocks were adapted from a map by the Ministry of Energy and Energy Affairs, Government of the Republic of Trinidad and Tobago. Gridded bathymetric data provided by the General Bathymetric Chart of the Oceans (GEBCO) 30 arc-second grid (accessed via http://www.gebco.net/). Map and associated shapefiles created in ESRI ArcMap (version 10.3.1). The Caribbean Sea is one of the most important hotspots of shallow-water marine biodiversity in the world (Miloslavich et al., 2010, 2011; Tittensor et al., 2010). The limited exploration of the deep Caribbean means that there is insufficient information to make similar statements about the deep-sea species richness and diversity. Scientific exploration of the deep ocean off Trinidad and Tobago has been limited to only three major expeditions, resulting in limited knowledge of this ecosystem and its contribution to biodiversity. In 1884, the USS Albatross collected one benthic trawl from depths of ~1,600 m, resulting in the collection of approximately 200 specimens (Townsend, 1901). During the 1980s, scientists from IFREMER discovered extensive chemosynthetic communities associated with mud volcanoes and methane seeps, resulting from the tectonic compression of fluid-rich marine sediments during the subduction of the Atlantic Plate under the Caribbean Plate that creates the extensive Barbados Accretionary Prism (Westbrook and Smith, 1983; Le Pichon et al., 1990; Olu et al., 1996, 1997; Sibuet and Olu, 1998). Similar seep environments were also discovered off Barbados and Venezuela at depths of 1,680–5,000 m (Jollivet et al., 1990; Olu et al., 1996, 1997; Sibuet and Olu, 1998). 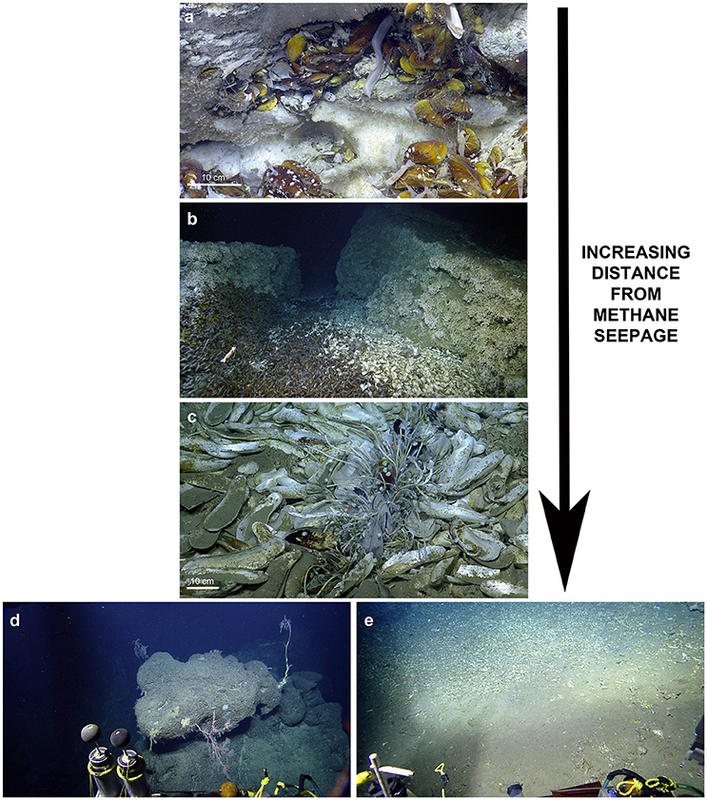 Methane seeps are patchy areas of the seafloor where methane and other hydrocarbons seep out of underground reservoirs through fractures and faults caused by tectonic activity, resulting in patchy ephemeral chemosynthetic communities, and enhancing deep-sea environmental heterogeneity (Hecker, 1985; Sibuet and Olu, 1998; Levin and Sibuet, 2012). Trinidad and Tobago's Exclusive Economic Zone (EEZ) has likely hosted chemosynthetic fauna since the Cenozoic, as there has been a rich fossil history uncovered in terrestrial deposits with many similarities between modern and past species (Gill et al., 2005). 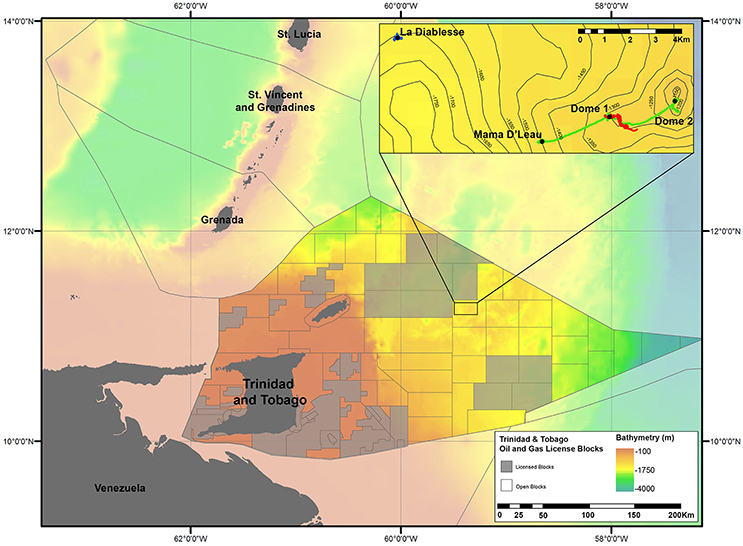 El Pilar is the only explored area located within the EEZ of Trinidad and Tobago, and was found to be inhabited by at least 12 previously unknown species of chemosynthetic fauna (Jollivet et al., 1990; Olu et al., 1996; Sibuet and Olu, 1998). Two areas within the El Pilar site were explored in the 1980s: “Dome 1” featured small beds of the mussel Bathymodiolus childressi, Neovermilia serpulids, and thickets of vestimentiferans (Olu et al., 1996). “Dome 2” hosted an enormous B. childressi community with mussel densities of 800 ind.m−2 comprising a range of sizes (Olu et al., 1996). There were also dense mussel shell aggregations present (Olu et al., 1996). Bathymodiolus mussels and vestimentiferans are foundation species, creating habitat for other species and modifying the physical and chemical environment (Govenar, 2010). Neovermilia serpulids were abundant around the mussel beds, whereas shrimp (Alvinocaris muricola), anomuran crabs (Lithodes manningi), large brachyuran crabs, echiuran worms, and chitons (Leptochiton micropustulus) were observed in the mussel beds (Olu et al., 1996). Both domes also featured at least three species of gastropods (Olu et al., 1996). Many of the species associated with the mussel and tubeworms assemblages have since been described and are considered to be endemic to seeps (Jollivet et al., 1990; Olu et al., 1996). With the impending start of deepwater hydrocarbon extraction off Trinidad and Tobago and the close affiliation of methane seeps with extractable oil and gas resources, the urgency for the regulation and management of these and other potential resources (fisheries, polymetallic nodules and other minerals, as well as bioprospecting) within the national jurisdiction has become more significant. Previous studies suggest that many deep-sea ecosystems have low resilience and recovery potential, but more importantly, that there is usually a high degree of uncertainty, so the precautionary approach should prevail (Ramirez-Llodra et al., 2011; Cordes et al., 2016; Huvenne et al., 2016; Van Dover et al., 2017). Environmental legislation should reflect modern environmental conservation practices by defining: (1) clear environmental goals and objectives, (2) the framework for environmental assessment and monitoring, (3) particular habitats or species that should be protected, and (4) the boundaries of areas designated for spatial management. Networks of protected areas (CBD Decision IX/20, Annex II) that capture 30–50% of the area (and representative habitats) within a region (Lodge et al., 2014), that consider cumulative impacts of sectoral activities and climate change in their design, and that ensure ecosystem services are not interrupted, are a key component of regional environmental management plans. In Trinidad and Tobago, there is presently no environmental legislation to accompany the expansion of deepwater exploration and exploitation of oil and gas, leaving known and unknown communities vulnerable. Knowledge of important ecological areas, such as methane seeps, are a key first step in designing protected area networks. This paper details the findings from the exploration of Trinidad and Tobago's deep ocean by Remotely Operated Vehicles (ROVs). In 2014, E/V Nautilus, in collaboration with scientists from Trinidad and Tobago, visited two previously sampled (Jollivet et al., 1990; Olu et al., 1996), and two unexplored areas of the El Pilar site (Carey et al., 2015). Here we describe the chemosynthetic communities and ecotones associated with the two previously visited sites (“Dome 1” and “Dome 2”) and the two new sites (“Mama D'Leau” and “La Diablesse”), including species richness, assemblage structure and ecological observations. We also compare these communities with other chemosynthetic communities in the Caribbean, Gulf of Mexico and off Costa Rica. Given the ecological and scientific importance of methane-seep communities, we recommend ways to increase the stewardship of Trinidad and Tobago's deep sea. E/V Nautilus conducted three exploratory ROV dives at four sites within El Pilar to the east of Trinidad and Tobago from 5 to 8 October 2014 (NA054) using the two-bodied system comprising ROV Hercules and towsled-style ROV, Argus (Figure 1 and Table 1). ROV Hercules was tethered to Argus via a neutrally buoyant tether while Argus was attached to the ship by 0.68 fiber cable, which allows real-time transmission of video, navigation, and data from the vehicles to operators and scientists aboard the ship. The ROV was equipped with two manipulators, a suction sampling system, push cores, and scaling lasers to measure objects. A TrackLink 5000 ultra-short baseline (USBL) navigation system was used to geolocate both ROVs, a Paroscientific Digiquartz pressure sensor was used to determine vehicle depth, and a IXSEA Octans III fiber-optic gyrocompass was used to determine vehicle attitude. The imaging and lighting suite was comprised of two Insite Pacific Zeus high-definition cameras (one on each vehicle) and CathX Aphos LED lampheads, which supply 28,000 lumens each. Additional lights and utility cameras aided in sampling and operational aspects of the dives. Table 1. Sites surveyed during NA054. 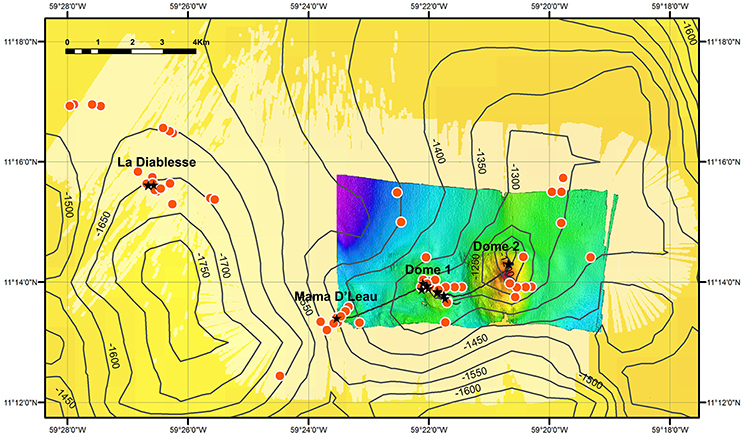 Exploratory video surveys were undertaken at all four sites (Figure 1 and Table 1): two of these had been visited previously (“Dome 1” and “Dome 2”) and two were unexplored (“Mama D'Leau” and “La Diablesse”). “Mama D'Leau” and “La Diablesse” were chosen for exploration after the shipboard EM302 multibeam water-column data detected numerous strong bubble plumes emanating from circular dome-like structures and ridges in the area (Carey et al., 2015). CTD (temperature, salinity, depth) data were collected throughout the dives, as well as a temperature probe used to collect specific temperature measurements. Faunal samples were collected with the ROV Hercules manipulators and suction sampler, and used as voucher specimens to aid identifications based on imagery. Once the ROV was on deck, fauna were quickly transferred to containers containing chilled seawater. Each sample was photographed, and a tissue subsample taken. Two types of biological samples were archived at Harvard University's Museum of Comparative Zoology (MCZ) for easy access by researchers worldwide: voucher samples (intact/whole organisms) and tissue samples (subsamples of a population or whole organism) that are used for genetic analysis. E/V Nautilus is equipped with a high bandwidth output satellite system. This is used to send video and data to the Inner Space Center at the University of Rhode Island's Graduate School of Oceanography, where it is then distributed via the Inner Space Center and NautilusLive websites directly to Exploration Command Centers for both public and scientific consumption. Through the Nautilus Scientist Ashore Program, a network of scientists around the world are connected to the watch-standing scientists on the ship to participate in the exploration in real time. A real-time chat between the watch leader and scientists ashore expands the expertise on board and allows for broader participation by scientists. Video from the high-definition camera on the ROV was reviewed and image frames archived of each identifiable megafaunal morphospecies. Criteria used for the selection of megafaunal morphospecies was that individuals were greater than 1 cm in maximum dimension and that there were sufficient details to identify them to a putative “species-level” morphospecies. Morphospecies that could not be identified to species but appeared morphologically distinct were assigned a unique informal species name (e.g., Polynoidae sp. 1). These were then identified by taxonomic experts (see section Acknowledgements) or using the literature. Fauna collected were also identified to the lowest possible taxonomic level. The presence or absence of each species was documented at each site using all available imagery. This process provided an estimate of the minimum number of morphospecies in the surveyed areas (species richness) and will aid in delimiting species ranges. Species accumulation curves and richness estimates were made using Primer v.6 (Clarke and Gorley, 2006). Since the species accumulation curve indicated that the species inventory had not yet reached asymptote and was continuing to accumulate, the recommendations of Magurran (2004) were followed and the Chao 1, Jacknife 2, and Bootstrap estimators were used to estimate total species richness. 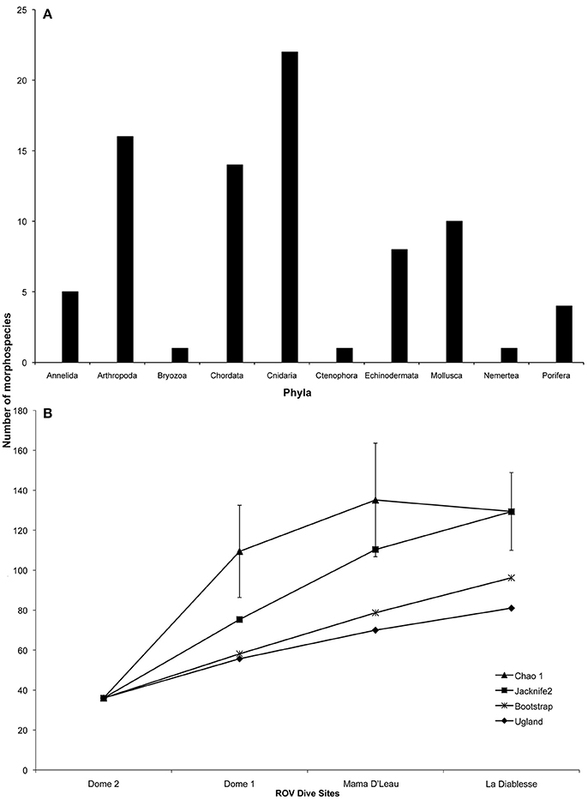 Sorensen's coefficient was used to compare the similarity at morphospecies level between the presence/absence data of the faunal assemblages at the four sites visited. Figure 3. Zonation at El Pilar off Trinidad and Tobago. The five habitats observed at the four El Pilar sites, in order of increasing distance from methane seepage: (a) Dense aggregations of amphipods on methane hydrate, which is surrounded by chemosynthetic Bathymodiolus childressi, Alvinocaris cf. muricola, Pachycara caribbaeum, and other fauna. (b) Abundant filter-feeders (e.g., Neovermilia serpulids, Stenohelia profunda, Haplosclerida n. sp.) on authigenic carbonate structures adjacent to Bathymodiolus mussel beds. (c) Bathymodiolus shell aggregations, which can sometimes have discrete bushes of Lamellibrachia sp. 2, live B. boomerang, A. cf. muricola, Kanoia cf. meroglypta gastropods, and other small fauna. Furthest from the active methane seeps are (d) authigenic carbonates that host large sparse octocorals and their commensals and/or (e) inactive sedimented areas. Figure 4. Megafaunal morphospecies richness observed at El Pilar off Trinidad and Tobago. (A) Megafaunal morphospecies richness by phylum. (B) Chao-1 (±s.d. ), Jacknife2, Bootstrap, and Ugland (UGE) estimates of megafaunal morphospecies richness with increasing number of ROV dive sites. Table 2. Megafaunal morphospecies observed from all imagery collected during NA054 off Trinidad and Tobago. “DOME 1”: Three areas of “Dome 1” at the El Pilar site were explored moving from southeast to northwest. There was an extensive chemosynthetic community of adult and juvenile Bathymodiolus childressi, Lamellibrachia sp. 2, Alvinocaris cf. muricola, Pachycara caribbaeum, Kanoia cf. meroglypta and cf. Munidopsis sp. 1 growing on authigenic carbonate pinnacles (Figure 2). There were also crevices with thickets of Lamellibrachia sp. 2. indicating subsurface seepage. Downslope was bubble venting and reduced (dark) sediment with a different habitat featuring Stenohelia cf. profunda, Haplosclerida n. sp., sparse Laubiericoncha cf. myriamae shells, Neovermilia sp. and dead and live Lamellibrachia sp. 2 in high abundances on the carbonates. Further from visibly active seepage was another habitat comprised of several large octocorals with commensals, the octopus Graneledone n. sp., actiniarians and fish (Table 2). Moving northwest to the second site at “Dome 1,” there were both sedimented areas and active seeps with methane hydrates, Bathymodiolus childressi, Lamellibrachia sp. 2, Alvinocaris cf. muricola, Pachycara caribbaeum, cf. Neovermilia sp., cf. Munidopsis sp. 1, Chaceon cf. fenneri, amphipods, Kanoia cf. meroglypta and Bathynerita cf. naticoidea. Surrounding the mussel bed were authigenic carbonates covered with beds of cf. Neovermilia sp., Haplosclerida n. sp. and Stenohelia cf. profunda. Several B. childressi shell deposits were also observed. There were also sedimented areas with depressions that contained seeps, some of which were well developed, containing bacterial mats, B. childressi, K. cf. meroglypta, Lamellibrachia sp. 2, A. cf. muricola, cf. Neovermilia sp., cf. Munidopsis sp. 1, P. caribbaeum and cf. Methanoaricia sp., while others were sparsely populated. The most northwest site was mostly sedimented and inactive with small carbonates and only four discrete areas of seepage. The first area of activity was dominated by extensive beds of cf. Neovermilia sp., with Lamellibrachia sp. 2, Stenohelia cf. profunda, cf. Zoanthidae sp., and several other morphospecies also present. The other seep communities were in depressions and were dominated by dead and live cf. Neovermilia sp., as well as bacterial mats, Bathymodiolus childressi, Lamellibrachia sp. 2, Haplosclerida n. sp., S. cf. profunda and Kanoia cf. meroglypta. There were also several mobile crustacea and chordates present as well as many dead Laubiericoncha cf. myriamae shells. In total, 24 of the 58 morphospecies observed at “Dome 1” were found at no other site (Table 2). “DOME 2”: “Dome 2” of the El Pilar site, previously explored by Olu et al. (1996), hosted an area of active seepage with associated chemosynthetic communities within a depression. This was centered on an authigenic carbonate overhang where methane hydrate was accumulating (Figure 2). Amphipods were abundant on the methane hydrate, as well as in the surrounding mussel bed, which was dominated by Bathymodiolus childressi, Alvinocaris cf. muricola, and Pachycara caribbaeum. There were abundant cf. Neovermilia sp., Haplosclerida n. sp., Stenohelia cf. profunda and Lamellibrachia sp. 2 on and in cracks of the carbonates surrounding the mussel bed. Adjoining the chemosynthetic community was a large area of empty B. childressi shells. South of the active seep were large carbonates that hosted at least five species of octocorals (cf. Chrysogorgiidae sp., cf. Plumarella sp. 1, cf. Plumarella sp. 2, cf. Thouarella sp., cf. Keratoisidinae -B1 clade sp.) and their commensals (Figures 3, 5). Of the 46 morphospecies observed at “Dome 2,” 18 were observed at no other site (Table 2). “MAMA D'LEAU”: “Mama D'Leau” had never been visited previously and was comprised of chemosynthetic habitats on a slope amongst large authigenic carbonates (Figure 2). At “Mama D'Leau,” the carbonates hosted abundant Haplosclerida n. sp., Stenohelia cf. profunda and Lamellibrachia sp. 2, peripheral to areas of seepage that were inhabited by bacterial mats, Bathymodiolus childressi with Gastropoda sp. 1 living on the shells, Alvinocaris cf. muricola, Lamellibrachia sp. 2, Pachycara caribbaeum, cf. Munidopsis sp. 1 and Kanoia cf. meroglypta (Figure 2). The chemosynthetic communities tended to be in depressions and were surrounded by large beds of empty B. childressi shells. Several other species were observed in this area including cf. Erenna sp., Graneledone n. sp., and Plinthaster cf. dentatus (Figure 5). All 19 morphospecies observed at “Mama D'Leau” were observed at other sites explored during NA054 (Table 2). “LA DIABLESSE”: The chemosynthetic communities at “La Diablesse” comprised large Bathymodiolus childressi beds on authigenic carbonates and had never been imaged before. These beds also housed Alvinocaris cf. muricola, Pachycara caribbaeum, cf. Amphipoda spp., cf. Gastropoda sp. 1, and Paralomis cf. arethusa. There were several areas of methane-gas escape and methane hydrate, which were covered in amphipods. Downslope from the live B. childressi beds were large beds of empty shells of B. childressi and B. boomerang, which had sparse thickets of Lamellibrachia sp. 2, Kanoia cf. meroglypta, Demospongiae sp. 2 and bacterial mats interspersed. These shell aggregations adjoined sedimented areas, which hosted a different complement of fauna that included Paroriza cf. pallens and Ophiuroidea sp. (Figures 2, 3 and Table 2). 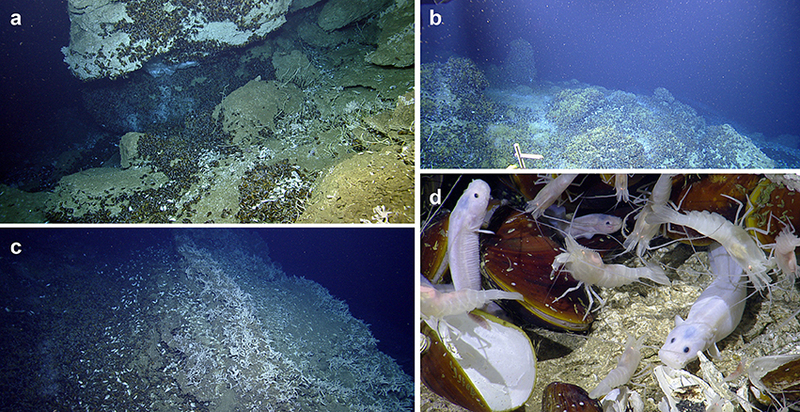 Five different habitats were observed at all four of the deep-sea sites that were surveyed: (a) active methane seeps dominated by Bathymodiolus mussel beds, (b) peripheral abundant filter-feeders (e.g., Neovermilia sp., Stenohelia profunda, Haplosclerida n. sp.) on authigenic carbonate structures adjacent to mussel beds, (c) mussel shell aggregations, (d) sparse octocorals and other non-chemosynthetic fauna on authigenic carbonate structures further from mussel beds, and (e) inactive (no evident methane seepage or indicators of seepage) sedimented areas (Figures 3a–e). Areas of methane hydrate in active seeps (1) were covered with dense populations of amphipods (approximately 10,000 ind.m−2, although this is likely an underestimate) (Figure 3). Surrounding the methane hydrate were beds of Bathymodiolus childressi, the dominant fauna that live in closest proximity to the methane seepage (Figure 2). Mean mussel densities were generally consistent between sites apart from at “Dome 1” (“Dome 1”: 712 ind.m−2, “Dome 2”: 277 ind.m−2, “Mama D'Leau”: 269 ind.m−2, “La Diablesse”: 312 ind.m−2). Maximum densities were much higher when juvenile mussels were present, e.g., at “Dome 1”: 1353 ind.m−2. Always inhabiting these mussel beds were Alvinocaris cf. muricola (mean densities - “Dome 1”: 199 ind.m−2, “Dome 2”: 29 ind.m−2, “Mama D'Leau”: 32 ind.m−2, “La Diablesse”: 142 ind.m−2), and Pachycara caribbaeum (mean densities - “Dome 1”: 20 ind.m−2, “Dome 2” and “Mama D'Leau”: 1 ind.m−2, “La Diablesse”: 15 ind.m−2). These mean densities are likely underestimates given the likelihood of multiple layers of fauna in the mussel beds. Other fauna were also common within the mussel beds including cf. Neovermilia sp. and cf. Gastropoda sp. on B. childressi shells, cf. Munidopsis sp. 1, Chaceon cf. fenneri. Plinthaster cf. dentatus, Kanoia cf. meroglypta, and several lithodid species. A number of other polychaete and mollusc species were observed in the beds but more rarely (Table 2). Occasionally, there were bushels of Lamellibrachia sp. 2 in the live mussel beds but these were mostly seen on carbonates surrounding the Bathymodiolus beds, along with dense populations of cf. Neovermilia sp., Haplosclerida n. sp., and Stenohelia cf. profunda. Adjacent to these habitats were large beds of dead Bathymodiolus spp. shells on sediment, sometimes with small patches of Lamellibrachia sp. 2 or B. boomerang (Figure 3). Further away from the active seepage and chemosynthetic communities but located on the large carbonates were isolated octocorals and their commensals, as well as actiniarians (Figure 3). Sedimented areas surrounded the carbonates and seeps (Figure 3). There were no temperature anomalies observed at the four sites investigated (ambient temperature was 4.0–5.7°C). At “Dome 1,” a Chaceon cf. fenneri was observed feeding on Bathymodiolus childressi, while scavenging amphipods appeared to benefit from sloppy feeding by the crab (Figure 5). Other feeding interactions inferred included several C. cf. fenneri crabs missing legs and an octopus (Graneledone n. sp.) dwelling with a B. childressi shell midden (Figure 5). All four sites showed ongoing recruitment of chemosynthetic species: At “Dome 1,” there were high densities of gastropod eggs on adult Bathymodiolus childressi, a gravid C. cf. fenneri crab, and varying sizes of Alvinocaris cf. muricola shrimp (2.9–11.8 cm total length) and B. childressi mussels (0.9–17.1 cm total length). “La Diablesse” also showed varying sizes of B. childressi, A. cf. muricola, and Pachycara caribbaeum eelpouts (1.8–14.6, 2.3–11.6 cm and 5.1–24.7 total length respectively) (Figure 5). At “Mama D'Leau,” there was also ongoing recruitment of B. childressi as indicated by variable shell size. “Dome 2” showed little recruitment with few young B. childressi observed, mostly in patches amongst beds of adult mussels and clutches of gastropod eggs on adult mussel shells. We provide new insights into the seep communities at four sites in El Pilar off Trinidad and Tobago. Our results indicate that Trinidad and Tobago's deep sea is poorly characterized with the majority completely unknown, emphasized by at least five of the morphospecies observed appearing to be new to science: cf. Haplosclerida n. sp., cf. Graneledone n. sp., cf. Paraphelliactis n. sp., cf. Paralomis n. sp. and cf. Halicreatidae n. sp (Voight and Kurth, 2017) (E. Rodriguez, pers. comm. ; D. Lindsay, pers. comm., E. Macpherson, pers. comm., S. Pomponi, in prep.). Pachycara caribbaeum, a zoarcid present in large numbers at every site at El Pilar, has also been described from these sites as well as an additional Caribbean site recently (Anderson et al., 2016). Morphospecies richness within our surveys appears to be high (83 morphospecies) relative to other chemosynthetic habitats in the region e.g., 32 morphospecies were observed at the Cayman vent fields (Plouviez et al., 2015). Species richness in this area remains undersampled indicating that more data are required to better understand how these diverse assemblages will be impacted by oil and gas exploration and exploitation. There do not appear to have been any major changes at “Dome 1” and “Dome 2” during the last 30 years: both sites continue to have active seepage and thus have similar faunal assemblages dominated by Bathymodiolus mussels (Jollivet et al., 1990; Olu et al., 1996). The five major habitats observed reemphasises that seeps are patchy areas with conspicuous zonation of the dominant taxa and demonstrates that there are expanded footprints beyond the source of seepage (Olu-LeRoy et al., 2004; Levin et al., 2016). The majority of species found closest to the areas of seepage in mussel beds benefit from chemosynthetic nutrition. For example, Bathymodiolus childressi are known to have methanotrophic bacteria and thus live in active seep sites where methane is present in the bottom water above the carbonates (Olu et al., 1996). Bathymodiolus mussels are foundation species that are responsible for modifying the environment at chemosynthetic habitats and provide hard substrate and shelter for many smaller morphospecies, as was observed during this study (Cordes et al., 2010; Levin et al., 2016). Interestingly, high abundances of amphipods on methane hydrate have not been seen before and suggests that the amphipods may occupy a similar trophic niche to the hesionid Hesiocaeca methanicola, which grazes on the abundant free-living chemoautotrophic bacteria on the hydrate (Figure 3; Fisher et al., 2000; Becker et al., 2013). Always inhabiting mussel beds were Alvinocaris cf. muricola and Pachycara caribbaeum. A. cf. muricola has been suggested to specialize on a variety of food items including free-living bacteria and meiofauna (Becker et al., 2013). Pachycara caribbaeum predate on Rimicaris hybisae at the Von Damm vent field, so it is plausible that this species may feed on A. cf. muricola or other small crustaceans within the mussel beds (Anderson et al., 2016). Other scavengers or carnivores include Chaceon cf. fenneri and amphipods, cf. Munidopsis sp. 1, Graneledone n. sp. and several lithodid species (Figure 5; Macpherson, 1994; Levin et al., 2016). Molluscs common in the mussel beds and likely grazing on bacteria included cf. Gastropoda sp. on B. childressi shells, Bathynerita naticoides, and Kanoia cf. meroglypta. These molluscs, A. cf. muricola and P. caribbaeum are vent/seep endemics as they are absent from the surrounding benthic areas, whereas the other mobile scavengers are likely opportunistic vagrant fauna (Carney, 1994; Olu et al., 1996). Fishes and echinoderms observed in the vicinity of the seep communities are also likely vagrants (Olu et al., 1996). Lamellibrachia sp. 2, cf. Neovermilia sp., Haplosclerida n. sp., and Stenohelia cf. profunda were the main inhabitants of the ecotone between live Bathymodiolus beds and authigenic carbonates hosting non-chemosynthetic fauna. Lamellibrachia sp. 2 are associated with endosymbiotic sulfur-oxidizing bacteria that depend on sulfides being produced in sediments that they absorb via their tubes, which are either partially buried in the sediments or slotted into cracks in carbonate concretions (Fisher, 1990; Olu et al., 1996). Thus, they can live in less active locations, such as on authigenic carbonates, because of their ability to mine sulfide (Freytag et al., 2001) and are considered endemic foundation species (Cordes et al., 2010; Levin et al., 2016). The other epifauna in this ecotone are likely seep-endemic filter feeders benefiting from the horizontal advection of particulate organic material from the mussel beds (Olu et al., 1996; Sibuet and Olu, 1998). Adjacent to and usually downslope from active areas were large beds of dead Bathymodiolus spp. shells overlying sediment, sometimes with small patches of Lamellibrachia sp. 2 and B. boomerang (Figure 3). B. boomerang hosts both sulfur-oxidizing and methanotrophic bacteria, allowing them to use either methane or hydrogen sulfide and thus be well adapted to survive in a range of potential fluid compositions (Von Cosel and Olu, 1998). Shell aggregations may be as a result of B. childressi's inability to tolerate fluctuations in fluid flow, and likely host diverse macrofaunal communities (Olu et al., 1996; Levin et al., 2016). Further away from the active seepage and chemosynthetic communities but located on the authigenic carbonates was an ecotone of isolated octocorals and their commensals (actiniarians, ophiuroids, squat lobsters etc. ), and other fauna (Figure 3). Here the authigenic carbonates are used by benthic background fauna as a source of hard substrate and shelter, and also provide access to food through the position in the current (Olu et al., 1996; Quattrini et al., 2015; Levin et al., 2016). Beyond that ecotone were sedimented areas that had a different faunal assemblage mostly comprised of deposit feeders (Figure 3). Many of the fauna observed off Trinidad and Tobago during NA054 have been observed at other chemosynthetic sites within the region despite the ephemeral patchy nature of these habitats. The closest surveyed deep-sea sites to El Pilar are Orenoque A (1,680–1,700 m) and Orenoque B (1,950–2,080 m), which are 115 km apart, and appear to have similar faunal assemblages to El Pilar, suggesting larval exchange between all three areas (Olu et al., 1996). There appear to be at least 15 species in common with Orenoque A (Olu et al., 1996). Orenoque A, like El Pilar, was dominated by Bathymodiolus childressi and B. boomerang but also featured live and dead vesicomyids, Alvinocaris cf. muricola and vestimentiferans (although it is unclear which species) (Olu et al., 1996; Von Cosel and Olu, 1998, 2008; Karasevaa et al., 2016). At Orenoque A, maximum Bathymodiolus densities appear to be similar (256 ind.m−2 for adults rising to 1,670 ind.m−2 for juveniles), and there was also evidence of high levels of recruitment (Olu et al., 1996). There were also amphipods, Bathynerita naticoidea, Neovermilia sp., Paralomis arethusa, and Munidopsis sp. 1 and sp. 2 observed in the mussel beds (Jollivet et al., 1990; Macpherson, 1994; Olu et al., 1996; Bellan-Santini, 1997). The presence of octopuses and zoarcids can be inferred to be Graneledone n. sp. and Pachycara caribbaeum but need to be confirmed. Similar to the El Pilar seeps, surrounding the mussel beds was an ecotone of filter-feeding Neovermilia sp. and sponges attached to the carbonates, followed by an outer eoctone of octocorals (Olu et al., 1996). Orenoque B appeared to have a slightly different faunal assemblage to El Pilar and Orenoque A, in that there was only B. boomerang present and an absence of filter feeders, which may be as a result of the difference in depths (Olu et al., 1996). Mud volcanoes known from 4,700 to 5,000 m off Barbados are dominated by Calyptogena, galatheids, gastropods, and cladorhizids and appear to have no faunal overlap with the communities at El Pilar despite the close proximity (Le Pichon et al., 1990; Vacelet et al., 1996; Olu et al., 1997). This is likely due to the large differences in depth and geology. Methane seeps located on the deep slopes of Kick'em Jenny submarine volcano off Grenada may have at least seven species in common despite very different geology (Carey et al., 2014, 2015). These include Alvinocaris cf. muricola, Bathymodiolus boomerang, Laubiericoncha cf. myriamae, Lamellibrachia sp. 2, Neovermilia sp., Gastropoda sp. 1 and Kanoia cf. meroglypta. The co-occurrence of several species is not surprising given the close proximity (450 km) (Carey et al., 2014). There is also faunal overlap between El Pilar, Orenoque A and Kick'em Jenny with the Von Damm vent field in the Mid-Cayman Spreading Centre (MCSC) despite an approximate distance of 2,000 km: Lamellibrachia sp. 2 (genetically identical – 100%), B. childressi and Pachycara caribbaeum (Connelly et al., 2012; Plouviez et al., 2015; Anderson et al., 2016). A. cf. muricola may also co-occur but further investigations need to be undertaken (Plouviez et al., 2015). The overlap with Von Damm vent field but not Beebe vent field, which is also in the MCSC, is likely due to the similar sedimented and shallow nature of the Von Damm vent field when compared with the Beebe vent field (4,960 m). The seep-specific fauna, Lamellibrachia sp. 2 (genetically identical−100%), A. cf. muricola, and B. childressi, as well as Bathynerita naticoidea and K. cf. meroglypta also dominate both the El Pilar seeps and several Gulf of Mexico seeps of similar depths (Sibuet and Olu, 1998; Cordes et al., 2007b; Miglietta et al., 2010; Olu et al., 2010). The predominantly easterly current in the region suggests that there are at least two stepping stones (Kick'em Jenny and Von Damm vent field, as well as others as yet undiscovered) for the westward and northerly migration of fauna from the seeps on the Barbados Accretionary Prism (El Pilar and Orenoque) up through the Caribbean and into the Gulf of Mexico (Bergquist et al., 2003; Cordes et al., 2007b; Arellano et al., 2014; Carey et al., 2014). This number should further increase if organic falls are considered, but still emphasizes the importance of each of these sites for dispersal (Smith et al., 1989, 2015; Dando et al., 1992; Feldman et al., 1998). However, the potential for dispersal among these sites depends on the depth range within which the larvae of various species travel and the duration of the larval life spans, of which very little is known (Tyler and Young, 1999; Cordes et al., 2007b). Arellano et al. (2014) reported that the larvae of Bathymodiolus childressi and Bathynerita naticoidea migrate into shallower waters (< 100 m depth) allowing them to take advantage of faster surface currents that may facilitate long-distance dispersal. It was estimated that B. naticoidea could be in the planktonic dispersal phase for 7–12 months, whereas B. childressi could migrate for up to 16.5 months. Additionally Young et al. (2012) estimated larvae originating near Barbados had the potential of colonizing virtually the entire Caribbean area and the southeastern Gulf of Mexico, with most individuals being retained in the Caribbean, during a larval life of 13 months. Further afield, the El Pilar seep communities exhibit affinities (at least eight overlapping genera and many overlapping families) with the hydrothermal seep fauna of Jaco Scar at 1,800–1,900 m off Costa Rica in the Pacific Ocean. Beyond the foundation taxa Lamellibrachia and Bathymodiolus, common taxa present at El Pilar and Jaco Scar include Pachycara, Neovermilia, Alvinocaris, Paralomis, Kanoia, and Graneledone (Levin et al., 2012). Notably absent were vesicomyid clam communities common in the Pacific. There are also some affinities with taxa reported from the newly discovered Pescadero Transform Fault at 2,400 m in the Guaymas Basin (Goffredi et al., 2017). Thus, similarities of the Atlantic equatorial belt seep fauna may extend into the Pacific, with depth zonation playing a key role in community structure (Olu et al., 2010). Methane seeps frequently occur in areas of economic interest because of their direct association with oil and gas-rich fluids (Sibuet and Olu, 1998; Bergquist et al., 2003; Cordes et al., 2003, 2016; Bernardino et al., 2012; Jones et al., 2014). Although there has been wide-ranging deep-sea exploration off Trinidad and Tobago, the majority of this work has been undertaken by oil and natural gas companies and the data have not been made publically available. The four study sites described in this paper host methane seeps and associated chemosynthetic communities. Furthermore, as previously concluded by Jollivet et al. (1990) and Carey et al. (2015), the abundance of methane gas plumes (85) detected in the limited EM302 water-column data (approximately 140 km2) suggests that a large number of as yet undiscovered chemosynthetic communities populate this area east of Trinidad and Tobago (Figure 6). However, it cannot be concluded that each of these gas plumes represents a unique site. Figure 6. Locations of prospective methane-seep sites. Red dots are the locations of methane bubbles emitted from the seafloor (indicative of seepage) that were identified from water column data using the shipboard EM302 multibeam, while black stars are locations of bubble streams visually confirmed with the ROV Hercules. Gridded bathymetric data provided by the General Bathymetric Chart of the Oceans (GEBCO) 30 arc-second grid (accessed via http://www.gebco.net/). Map and associated shapefiles created in ESRI ArcMap (version 10.3.1). The high-resolution central section was constructed from unpublished ship-based bathymetry data from the EV Nautilus. The entire light yellow area was surveyed with the ship-based multibeam but due to adverse surveying conditions, only the water column data were useful. Methane seeps are of particular importance given their high primary productivity, relatively high biomass and diversity, and high endemicity. Seeps have also been shown to provide regulating, provisioning and cultural ecological services that are likely irreplaceable (e.g., biogeochemical cycling, enhancing fisheries, and providing inspiration respectively; Levin et al., 2016). A combination of slow growth and long life spans for some seep taxa (Cordes et al., 2007a; Durkin et al., 2017), and variable and/or poorly understood recruitment (Cordes et al., 2003; Arellano and Young, 2009), means that recovery from impacts can be prolonged (Cordes et al., 2016). The fauna that live in peripheral ecotones and habitats of these sites are also distinct from the fauna in other areas of the deep sea, so deserve recognition as a distinct biodiversity component and consideration for protection (Demopoulos et al., 2010; Levin et al., 2016). Furthermore, as seeps are relatively small and patchy, they may be more susceptible to anthropogenic impacts as the scale of the disturbance will likely be more concentrated, and island-like habitats are particularly prone to local extinction (Rowden et al., 2016). Given these attributes, methane seeps are considered to have the characteristics of vulnerable marine ecosystems (VME), defined by the FAO as vulnerable to bottom fishing. Methane seeps overlap with the following VME criteria: an ecosystem that hosts endemic taxa, is structurally complex and fragile, and contains difficult-to-recover species (e.g., those with slow growth rates, late maturity and that are long-lived. VME criteria are similar to those of ecologically and biologically significant areas (EBSAs) as defined by the UN Convention on Biological Diversity (CBD). EBSAs are “discrete areas, which through scientific criteria (similar to those listed for VMEs; see Ardron et al., 2014 for comparison of VME and EBSA criteria), have been identified as important for the health and functioning of our oceans and the services that they provide” (UNEP-WCMC, 2014; Cordes et al., 2016). The EBSA concept was developed under the United Nations Convention on Biological Diversity, which Trinidad and Tobago has been a signatory on since 1992 (Dunn et al., 2014; Cordes et al., 2016), but EBSAs have yet to be incorporated into any formal management structures (Dunn et al., 2014). (1) Given the prevalence of uncertainty with regard to the deep sea off Trinidad and Tobago, there is a need for a precautionary approach in order to protect and minimize significant environmental harm to what is still unknown. In current practice, protection of 30–50% of a management area for conservation, protection of 30–50% of each representative habitat, and protection of all important areas (meeting EBSA or VME criteria) through a network of protected areas is a first step in regional environmental management planning in the deep sea (Wedding et al., 2015). With regard to oil and gas and mineral extraction at the contractor level, the first two steps of the mitigation hierarchy (avoid, minimize) should be emphasized: restoration and offsetting are not deemed practical at this time for deep-sea ecosystems (Bank, 2012; Van Dover et al., 2017). For example, deep coral reefs (also potentially present in Trinidad and Tobago's EEZ) meet EBSA criteria and are thus targets for protection. Huvenne et al. (2016) assessed the effectiveness of a deepwater cold-water coral MPA, following 8 years of fisheries closure. The results suggested that even after 8 years as an MPA, there was low resilience and slow recovery potential of this deep-sea ecosystem. This resilience may be further reduced by warming and acidification acting as cumulative stressors, adding to the uncertainty of system responses (Levin and Le Bris, 2015). This research highlighted the importance of the application of the precautionary principle in deep-sea conservation. (2) Comprehensive environmental assessments, including but not limited to baseline research to characterize the natural variability, should be mandatory. Ideally, surveys should include high-resolution mapping, seafloor imagery surveys, and physical samples to characterize the faunal community and ensure proper species identifications. This faunal characterization should consist of a combination of morphological and molecular taxonomy of not only the large conspicuous species (megafauna) but also smaller size classes (microbes, meiofauna, and macrofauna) (Zeppilli et al., 2017). Beyond describing the biodiversity, environmental assessments should include measurements needed to evaluate the status and change in ecosystem functions and the services they support, consistent with ecosystem-based management. These measurements should incorporate the dynamics of the physico-chemical environment (including changing climate variables), presence/absence of habitats that meet EBSA and VME criteria, connectivity, benthic-pelagic coupling, and resilience in order to enable sound decision making and environmental management. While some of these costs should be covered by the industries working in the deep ocean, developing research funding independent of industry is also important. Furthermore, scientific research should extend to include Environmental Impact Assessments with monitoring before, during and after the activities as well as at control reference sites (Cordes et al., 2016). However, the reliability of EIAs depends on the quality of existing baseline data (Cordes et al., 2016). For example, following the Deepwater Horizon incident in the Gulf of Mexico, one of the most well-studied areas of the deep ocean, baseline data were found to be lacking in the immediate vicinity of the impacts and for many key components of the ecosystem (Cordes et al., 2016). (3) Legal framework & regional agreements for all types of deep-sea exploitation need to be drawn up and enforced at a standard that is equal to or better than those internationally and reflects modern practices of environmental conservation. For example, rigorous oil and gas regulations need to be put in place as per the recommendations of Cordes et al. (2016) e.g., buffer zones, and activity, temporal and spatial management. Local and regional spatial planning should be enforced after engaging all relevant stakeholders. This includes industry, government, policymakers, civil society, scientists, economists and local communities, and should aim for binding outcomes from those discussions. For spatial management to be effective, data on the distribution of features of conservation interest is essential (see second recommendation above). One of the goals of the spatial management should be to implement a network of MPAs in order to preserve significant and representative communities (EBSAs) locally and regionally (Dunn et al., 2014), similar to those proposed by de Mello Baez Almada and Bernardino (2016) off Brazil. As a Small Island Developing State, taking advantage of global expertise (e.g., the Deep-Ocean Stewardship Initiative) can aid this process. Given the ecological and scientific value of the El Pilar site and other seep areas within the Trinidad and Tobago EEZ, and the ongoing development of the deep-sea energy sector in the same area, it is timely for Trinidad and Tobago to develop a regional environmental management plan with stakeholders to protect the marine environment in the context of extractive activities. DA, JG, LM, and NR were integral in ROV video surveys and sample processing while at sea on the E/V Nautilus. DA collected and analyzed the data from imagery, while CVD analyzed the samples. DA wrote the main manuscript text with assistance from JG, LL, LM, NR, and CVD. LM prepared Figures 1, 6, while DA prepared Figures 2–5. All authors reviewed the manuscript. We wish to thank the Ministry of Foreign and CARICOM Affairs of the Republic of Trinidad and Tobago for issuing the research and collection permits, as well as the Master, crew and scientists of the EV Nautilus cruise NA054 for support during the fieldwork off Trinidad and Tobago. We are also very grateful to the taxonomic experts who helped in the identification of fauna: Helena Wiklund for the annelids, Mary Wicksten and Enrique Macpherson for the arthropods, Andrei Grischenko for the bryozoans, Kenneth Sulak and Bruce Mundy for the fish, Stephen Cairns, Les Watling, Estefania Rodriguez and Dhugal Lindsay for the cnidarians, Chris Mah for the asteroids, David Pawson for the holothurians, Tim O'Hara for the ophiuroids and Chong Chen for the molluscs. We also thank Amanda Ziegler for assistance with Primer analyses. JG acknowledges the award of a Visiting Fellowship from CVD and Duke University Marine Laboratory, a Visiting Fellowship from LL and the Center for Marine Biodiversity and Conservation at Scripps Institution of Oceanography, as well as a travel award from the International Seabed Authority, which allowed participation at the Deep-Sea Biology Symposium in 2015. The authors acknowledge NOAA Office of Exploration and Research grant # NA13OAR4600094, and the University of the West Indies for supporting this work. Bank, W. (2012). IFC Performance Standards on Environmental and Social Sustainability. Washington DC: World Bank. Clarke, K. R., and Gorley, R. N. (2006). Primer v6: User Manual-Tutorial. Plymouth Marine Laboratory. Fisher, C. R. (1990). Chemoautotrophic and methanotrophic symbioses in marine invertabrates. Aquat. Sci. 2, 399–436. Govenar, B. (2010). “Shaping vent and seep communities: habitat provision and modification by foundation species,” in The Vent and Seep Biota. Topics in Geobiology, vol 33, ed S. Kiel (Dordrecht: Springer), 403–432. Hecker, B. (1985). Fauna from a cold sulfur-seep in the Gulf of Mexico: comparison with hydrothermal vent communities and evolutionary implications. Bull. Biol. Soc. Washington 6, 465–473. Macpherson, E. (1994). Occurrence Of Two Lithodid Crabs (Crustacea: Decapoda: Lithodidae) In The Cold Seep Zone Of The South Barbados Accretionary Prism. Proc. Biol. Soci. Washington 107, 465–468. Magurran, A. E. (2004). Measuring Biological Diversity. Oxford: Wiley-Blackwell. Ministry of Energy Energy Industries (2017). Oil and Gas Industry Overview. Port of Spain: Government of the Republic of Trinidad and Tobago. Available online at: http://www.energy.gov.tt/our-business/oil-and-gas-industry/ (Accessed April 1, 2017). Rajnauth, J., and Boodoo, C. (2013). Trinidad and Tobago's first deep water drilling campaign. West Indian J. Eng. 35, 4–14. Townsend, C. H. (1901). “Dredging and other records of the United States Fish Commmission Steam Albatross with Bibliography Relative to the Work of the Vessel 1883-1900,” in U.S. Fish Commission Report for 1900. ed G. M. Bowers (Washington, DC: Government Printing Office). Von Cosel, R., and Olu, K. (1998). Gigantism in Mytilidae. A new Bathymodiolus from cold seep areas on the Barbados Accretionary Prism. Comptes Rendus de l'Academie des Sciences. Serie 3. Sci. de la Vie 321, 655–663. Von Cosel, R., and Olu, K. (2008). A new genus and new species of Vesicomyidae (Mollusca, Bivalvia) from cold seeps on the Barbados accretionary prism, with comments on other species. Zoosystema 30, 929–944. Copyright © 2017 Amon, Gobin, Van Dover, Levin, Marsh and Raineault. This is an open-access article distributed under the terms of the Creative Commons Attribution License (CC BY). The use, distribution or reproduction in other forums is permitted, provided the original author(s) or licensor are credited and that the original publication in this journal is cited, in accordance with accepted academic practice. No use, distribution or reproduction is permitted which does not comply with these terms.